beautiful landscape position (4 kilometres level and 2 uphill)..
From Roccastrada, by the large roundabout, one takes the provincial road S.P. 157 in the direction of Sassofortino and Monticiano. One cycles easily uphill for a pair of kilometres on the slopes of panoramic hills. 3 kilometres after the start one leaves the S.P. 157 and takes the S.P. 8 “Meleta” on the left in the direction of Sassofortino and Roccatederighi. 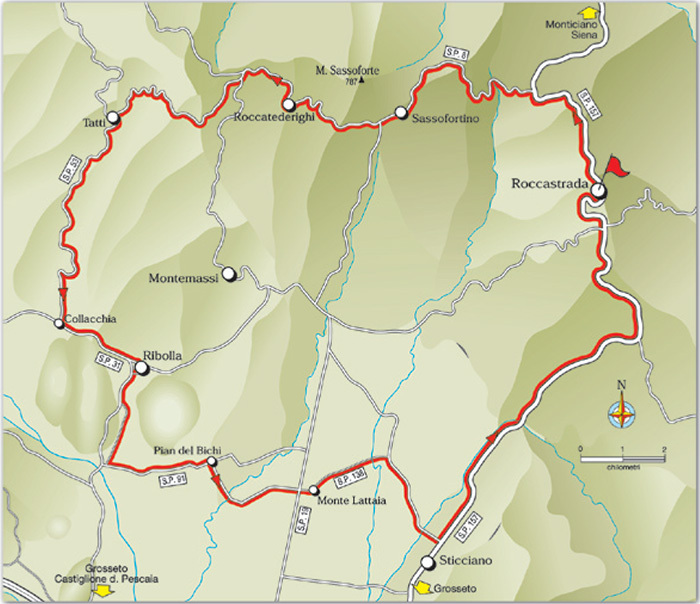 One pedals uphill reaching Sassofortino (560 metres above sea level) and continues on a panoramic road mostly downhill as far as Roccatederighi (12). At the next large crossing (14.3) one continues in the direction of Tatti and Ribolla. After 5 kilometres on a fair road surrounded by lush vegetation one reaches the centre of Tatti (19.3). From here one cycles on a very fine descent with panoramic view towards the plain, following the road signs to Ribolla and Grosseto, on the S.P. 53 ending at a T-crossing (26.4). Here one turns left cycling across the plain towards Ribolla on the S.P. 31. After 1.5 kilometres one enters the urban area of Ribolla as far as a crossing (28.3) where one turns right in the direction of Castiglione della Pescaia taking the provincial road S.P. 20. One covers a distance of 2.8 kilometres as far as a well-defined bend to the right. Here one turns left leaving the S.P. 31 and taking the S.P. 91 “Pian del Bichi” in the direction of Sticciano. One cycles across the plain for about 5 kilometres through cultivated land and vineyards with a fair view of Montemassi on the left. After a short climb among the vineyards and within sight of a large farm surrounded by centuries-old pines one turns right entering “Via Pian del Bichi”, leaving the S.P. 91 “Pian del Bichi” (36.2). The path bypasses the large farm and turns decidedly right through vineyards and a line of young pines. One keeps to the main road (after about 1.5 kilometres at the crossroads one keeps to the left) for over 3 kilometres as far as the crossing with the S.P. 19, to be orthogonally crossed to take the provincial road S.P. 138 “Monte Lattaia” (39.6). One cycles to the end for about 2.5 kilometres as far as the T-crossing (42). Here one continues on the right following the path along the main track (avoiding all deviations) for a pair of kilometres as far as a small low concrete bridge, which can turn into a ford in the event of heavy rains. Immediately after leaving it one clears a level crossing and reaches a well-defined T-crossing with the S.P. 157 (44.2) at which point one turns left towards Roccastrada (turning right one can reach Sticciano Scalo at the distance of about 1 kilometre). From this point one cycles on a level road fringed by a double row of stone-pines. After about 4 kilometres the road starts climbing uphill, not too steeply, through cork oaks and 3 kilometres further on the S.P. 157 turns left towards the rise of Roccastrada. One cycles for 5 kilometres uphill enjoying fair panoramic views towards the coast reaching Roccastrada as far as the roundabout in the middle of the town (57.2). The Lattaia Castle rises up amongst lush natural surroundings in the territory of Roccastrada. Located on a hill overlooking the Bai creek, this castle was one of the main strongholds of the Aldobrandeschi family as far back as the 10th century. In the early years of the 1200s, it belonged to the Pannocchieschi family. It was contested by local families and was taken over by the City of Siena in 1262. Over the course of the 14th century, Siena managed the castle through the powerful Incontri and Salimbeni families. At the beginning of the 1400s, this area was completely considered part of the Republic of Siena until the 16th century, when it was no longer necessary for defence. Thus, the complex was converted into a farm. The remains of the ancient fortress include the circular layout of its ancient walls, which enclose a square bordered by a few buildings. Also of interest is the small Church of St. Blaise, located at the very centre of the settlement; it faces a lawn with ancient cypress trees. Rectangular in shape and preceded by a portico, it was built in the first half of the 17th century and restored in the Neoclassical style in 1859. The plaque on the façade commemorates these works commissioned by Giulia Zondadari, owner of the entire estate. This church was probably erected to substitute a previous parish dedicated to St. Blaise. The original church was mentioned in historical documents in the 12th century, but it subsequently fell into ruin. Sito ufficiale della Cooperativa Colline Metallifere. Photo by Petitverdot: Matteo Vinattieri, licensed under the Creative Commons Attribution 3.0 Unported license. Wikimedia Commons contiene file multimediali su Monterotondo Marittimo.